One of the most highly-coveted “Holy Grails” of record collecting has always been Nils Lofgren’s Back It Up!! A 1975 promotional release by Lofgren’s label, A&M Records, the faux bootleg was actually cut live in the studio by Nils and band for a radio broadcast on San Francisco’s KSAN-FM. The folks at the label liked the performance so much that they decided that it was just the thing to light a fire under complacent FM radio programmers and support Lofgren’s critically-acclaimed self-titled debut album. With much less corporate bureaucracy to struggle with back in those days, the idea of an authorized “bootleg” album shuffled around the offices and quickly became a reality. The label pressed up 1,000 copies of Back It Up!! on vinyl with a plain white cardboard sleeve and crude photocopied insert, as was the style of bootleggers at the time, and mailed ‘em out to radio stations and the press. Although it netted Lofgren a fair amount of airplay and hype, history has proven that it did little to boost his record sales above those of any mid-card punter. As laid out by Bud Scoppa’s informative liner notes for Back It Up!! 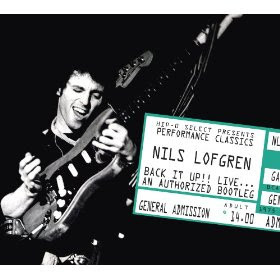 Live…An Authorized Bootleg, the label was hot to send the promo album out as a regular release, an idea nixed by the man Nils himself. Fearing that the live disc would interfere with sales of his second album, Cry Tough, the promo-only album was put back into the label’s vaults. Meanwhile, as Lofgren’s career continued on pace, with the talented guitarist eventually setting aside his solo work in favor of a gig with Springsteen’s E Street Band, the status of Back It Up!! continued to grow, a primo copy of the original PVC fetching low-to-mid three-figure prices in collector’s circles. I had seen several bootleg copies of Back It Up!! circulating around the various record conventions that I worked during the late 1970s/early '80s, especially in Detroit and Chicago, but the Reverend actually picked up his favored copy of the vinyl from a former label executive’s gotta-move-now-cause-I’m-outta-cash yard sale in Nashville for a mere $2.00. My copy looks like the real thing, but what the hell do I know? It could be a boot; if it is, it’s a good one: the vinyl sounds great and looks authentically grungy. Maybe I should do some DNA testing, though, ‘cause according to Scoppa, his roommate – noted rock critic R. Meltzer – was hired by the label to fix the inserts to the sleeve, his sweat inevitably mixing with the sticky glue. The performances captured by the album are simply electrifying, among the best you’ll hear from Nils, and these ears have heard a lot. Lofgren’s Keith Richards tribute, “Keith Don’t Go (Ode To The Glimmer Twin)” starts out with a tense, trippy guitar line straight from the Who playbook before breaking into Nils’ impassioned lyrical plea. The fretwork is stellar, Nils tearing off a number of crushing solos built atop the brickyard rhythms provided by his brother, guitarist Tommy Lofgren. “I Don’t Want To Know,” also from the solo debut, should have been a huge radio hit; a melodic rock number with fine vocal gymnastics and a BIG catchy hook guaranteed to grab you by the ears, it’s a classic tale of love and betrayal. This live version benefits from the addition of Al Kooper’s piano, the rock legend working on producing Lofgren’s sophomore effort at the time. The aforementioned cover of “Goin’ Back” offers Kooper’s light-hearted keyboard riffing and a breathless, smooth-as-silk vocal performance by Nils. “Beggar’s Day” jumps back into a rock groove after several pop-inflected cuts, the obscure Grin cut showcasing Lofgren’s tuffest vox and even tougher fretwork, his slice-and-dice solos filleting the slightly funky rhythms of bassist Scott Ball and drummer Mike Zack. Rock 'n' roll, much like life, is full of “what if” moments. What if you had married the geek that later started that billion-dollar software business rather than the high school quarterback? What if you’d bought that Google stock at $12 per share like your father-in-law suggested? What if Mr. Miyagi had refused to teach that punk kid any of his slick moves? What would have happened to Lofgren’s career if an excellent live set like Back It Up!! had been released to compliment both his debut album and Cry Tough? Would it have been enough to put Nils in the national spotlight, where his native talent and dynamic onstage presence might have brought him the stardom he deserves? As good as this set is, maybe Back It Up!! could have been better. Clocking in at slightly less than 45 minutes, the album feels incomplete by a song or two. Maybe Nils and his talented band only put these seven songs to tape, I don’t know. But if Hip-O Select had more of this stuff in the vault, they should have released an expanded version of Back It Up!! since it’s clearly the long-faithful fans that would be the most interested in this limited edition CD reissue.